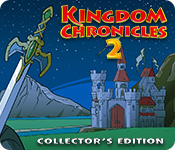 Kingdom Chronicles 2 Collector's Edition is rated 4.5 out of 5 by 28. Rated 5 out of 5 by GrannyCod from Really enjoy this game! Please don't make me wait so long for #3! I have really enjoyed this game! It is challenging, has a cute story line, and I remember the characters from the first one. It is challenging and i haven't made it through with 3 stars on all levels, but - - it's a GAME - - and I enjoy it! Roll up your sleeves and jump into the adventure of the gang trying to get the sword back! I recommend this game. Rated 5 out of 5 by Bumbles2 from Ohhhh...lovely...I get to pick some banana's !!! We really got into this game in a big way !!! We played the first release in this series way back in 2013 and we were so glad that this new release was all new !!! The story was perfect and they put it together in such a way that it captures your interest right away !!! The graphics are beautifully done by some very talented artists and the music fit the theme of the game !!! There are definitely some major challenges in this game and you're going to have to use some of your grey matter to accomplish these tasks !!! All in all...it's a brilliant game to play and we loved every minute of it !!! We bought the collectors edition after playing the demo for a few minutes...I immediately knew this was a winner !!! Try the Demo and have some fun and you'll see what I mean !!! Rated 5 out of 5 by tntgregor from Great Game! Well worth the money! Love this game. Very challenging! Most TM games are so slow or low level I finish them in a few hours. I've spent weeks trying to get 3 stars on all levels. Now that I'm working on the bonus levels, I wish there was a guide for these! I cannot get more than 2 stars on the last two bonus levels! If anyone has done better, please make a youtube or something! Great game for players who love a challenge! Rated 5 out of 5 by JeansLady1 from Excellent and fun game I have played both Kingdom Chronicle games and they are equally delightful. I do not play for stars, so I am like some others in that I prefer a relaxed mode. But, in this game you can still finish each episode after the timer runs out. If I get a star or two, great. If not, also great. Even without the timer, you have a scurry around a bit to defeat the orcs. I strive to do my best to finish in as good a time as possible without getting stressed out to the point that I stop enjoying the game. All of the characters are cute and clever, graphics are great, sounds are totally appropriate and add to the game. I just can't find any "downers" about this game - at least for me and the way I enjoy playing this type of TM game. I'm on episode 28 and just as eager to get back to the game as I was when I was started it. Rated 5 out of 5 by biscuitsmama from KINGDOM CHRONICLES 2 IS A FUN TM/STRATEGY GAME THAT KEEPS MY BRAIN HAPPY Kingdom Chronicles 2 is the follow-up game to the original that was released seven long years ago. Since I wasn’t playing TM or Strategy games at that time the wait hasn’t been as long for me as it has for those who absolutely loved the original. Because of the solid 5-Star rating for the game and because I have in more recent years developed an interest in TM games, I decided to give this one a go. Okay, I don’t generally even look at a TM game that has a timer but I didn’t let it stop me with Kingdom Chronicles because once I began to play the game I found out what others said was true. This is such a fun and excellent game! Okay, there is a timer but whoop-de-doo, it only really matters if you are someone who must have all 3 stars or you sink into desolation. Since I don’t really care whether I get all stars or not, I plodded on into this very fun game. Everything about Kingdom Chronicles 2 is quite entertaining and even though I am generally rubbish at playing this type of game I have had so much fun figuring out the strategies that will allow me to move ahead. Even though I won’t get 3 stars on most of the higher levels in the game, I can at least continue playing after the time runs out. Since I have enjoyed playing this game most of the morning, I went back and looked at the original Kingdom Chronicles game and decided to try it as well. The original game had an almost perfect 5-Star rating and I can see why the game has such a large following. So now I have 2 new TM/Strategy games to play. The graphics are very cute in Kingdom Chronicles 2 and I am enjoying the sound effects as well. I always play games with the sound no matter the type of game and it is rarely that I ever mute it so I was happy to find that I the sound effects in this game are very good and add to the fun in the game. Even though I am by no means an expert in playing TM/Strategy games I am having so much fun with Kingdom Chronicles 2 and have no hesitation in recommending the game even to beginners. As always I recommend that you try the demo to see if this is a game you will enjoy. Happy gaming! Rated 5 out of 5 by LavenderLion from Great Game! I just finished playing and had to say how much I enjoyed it. This is a sequel that stays true to the original while still adding new features. Some of the new things are quite unique, I especially liked the levels where there was a puzzle to solve along with the standard road clearing tasks. The game is not easy, I started having trouble getting 3 stars about halfway through but never lost interest in playing. (Unlike some games that have such sort time settings that it just becomes frustrating.) Towards the end it was fiendishly difficult. The game lets you keep going until you complete a level even if you dont get any stars. So there is no problem getting stuck on a level. The bonus levels are not just more of the same but are like getting another small game! Really nice and again a good challenge. The original Kingdom Chronicles is a favorite of mine and now this one is too! Well done dev team! And thanks to BF for bringing us a truly great TM game. Rated 5 out of 5 by plat1098 from Wait A Minute...Really?! Always expected this game to remain solo. Came here looking for new games...hello? What's this? Awesome! 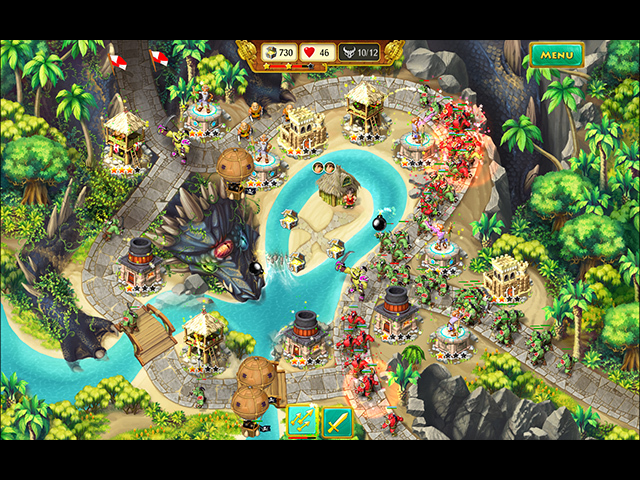 The graphics are refreshed and attractive, with greater detail to all the characters and resources structures. There are new and interesting elements to go along with the totally new environment while still retaining a lot of what you remember from the previous. You can queue your tasks but watch carefully what you have to accomplish. The only minus was the sudden tutorial which stretches across your screen like a banner. Good thing you can click it away. The background audio carries over some amusing interactive voices from the first KC, as well as its single music track so now the sound track is kind of an odd but pleasant blend of "old" and new. The best part is the challenge, the same "vibe" from the first, and as many know, it's a gamble when a game becomes a series. We definitely won here. Rated 5 out of 5 by M1ssy71 from So Happy it's back! Bought the first one in May of 2012, could not play as I updated my PC and did not work. It's all coming back! 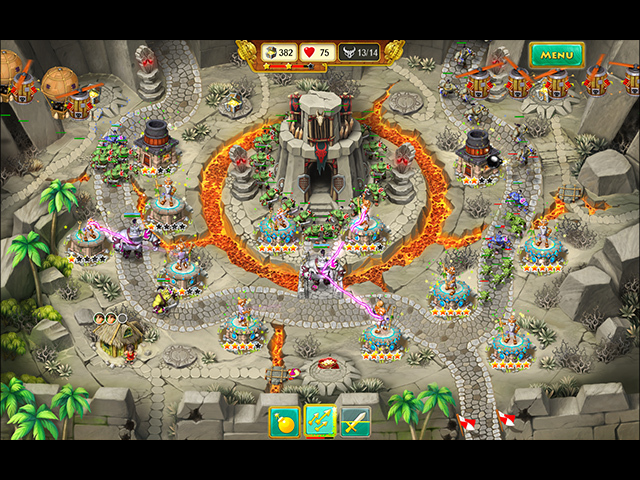 Great strategy, storyline, music and fun. Rated 5 out of 5 by grandmacathy from Great game! I didn't play the first Kingdom Chronicles, so I can't say how this game compares to that one. I can only say that I LOVED this one! The hour for the demo went way too fast! I hit the 'buy' button right away! Though it is listed as an adventure game, it is a time management one so far. I'm writing this after I finished the demo, and will start the next levels after writing this review. 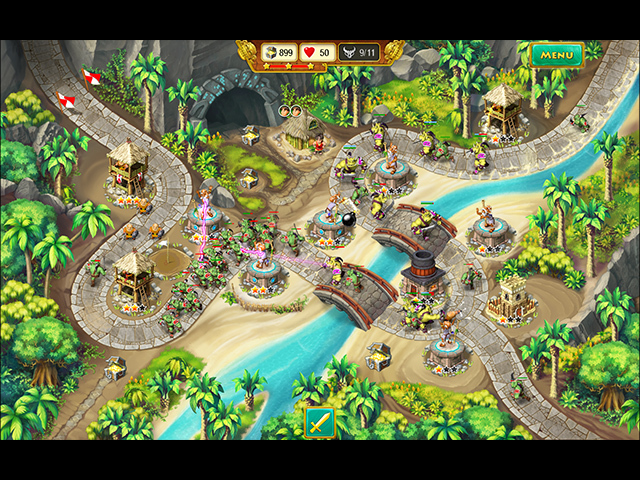 I like everything about this time management game: the story line, the characters, the goals and quests, even the Orcs! Great graphics and the music is fine (low-key in the background but at a tempo that matches the speed you need to complete the level with at least 2 stars). If you like time management games, you'll enjoy this one.